Think long and hard about the type, size, design and color of your backsplash tile. Fads and trends come and go; consider colors and patterns with classic, assured appeal. Make sure that you buy a sufficient number of tiles by carefully measuring the backsplash area. (This is especially important if you are purchasing discontinued designs.) It’s smart to buy a little extra, knowing that what you don’t use can be stored for use in future repairs. No matter how simple your backsplash design, take the time to lay out the entire project on the floor before putting it on the wall. (Alternatively, draw the planned arrangement of tiles on a sheet of graph paper.) 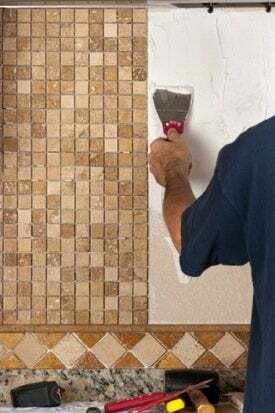 Doing so enables you to determine whether you have enough tiles to complete the job and whether any tiles require cutting. Photograph and print out a copy of the layout so that you have a visual reference to consult as you work. 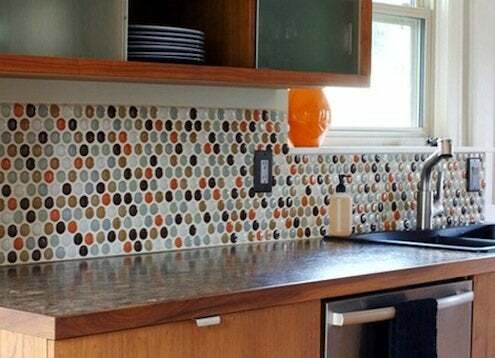 A backsplash project involves more than simply buying and placing tile. Make a list of all the supplies you need to get the job done from start to finish, then secure and organize those tools and materials in one place. Having everything required for the project before you begin will save time and reduce stress. Protect surfaces in your work area from dents, dirts, and scratches, using a roll of wallpaper from the thrift store. Fasten the wallpaper sheets with painter’s tape, so they can be easily removed later. Once you’ve finished, simply shred the paper and compost or recycle it. Leave yourself enough time to get the results that you want. If the experts’ two-day timeline makes you feel anxious, then allow an extra day or two. A holiday weekend is an ideal interval during which to take on a backsplash. DIY supplies will be on sale, and you won’t feel rushed to bring about your kitchen’s beautiful new look.